Learn Scrivener Fast is a course that teaches you how to get the most out of Scrivener, widely recognized as the leading software for writers. It helps you with tasks like plotting, creating characters, research, outlining and much more. Scrivener helps both fiction and nonfiction writers create more accomplished work in less time. There’s one catch, though. There’s a steep learning curve for learning how to use Scrivener. Once you master it, writing becomes easier. However, many people never get to this point because they have trouble learning all of the features. Learn Scrivener Fast was designed to solve this problem. 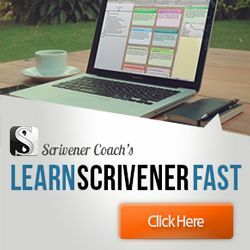 In this Learn Scrivener Fast review, we will analyze the course, see if it’s good value for money and provide all the currently available Learn Scrivener Fast discounts. Learn Scrivener Fast was created by Joseph Michael, a self-proclaimed tech-savvy guy who nevertheless found Scrivener extremely hard to figure out at first. He realized that others must have also been having this problem. So Joseph became obsessed with learning everything he could about Scrivener, studying not only the program itself but also every course and tutorial about it he could find. Joseph discovered that when you finally learn its inner secrets, Scrivener is indeed an incredibly powerful tool that can make you a better and more successful writer. He decided to put everything together in one, easy to follow, course. The result is Learn Scrivener Fast, which comes with recommendations from many leading authors such as Michael Hyatt and Joanna Penn. As Joseph says, Scrivener is for serious writers. If you’re just a casual writer, you don’t need a tool that helps you do extensive research, import chapters from various programs and create complex outlines. If you are fully committed to being a writer, though, it’s worth the effort to become an expert at Scrivener. Learn Scrivener Fast makes this task much less arduous. Setting up Scrivener quickly, whether you use a PC or Mac. How to navigate the Scrivener window and customize the toolbar. Corkboard Mastery – The Corkboard is a key Scrivener feature that helps you organize your writing. Many users, however, have difficulty with it. You’ll learn how to customize your background and index cards. Project Notes – a Scrivener feature that helps you organize your research. Using the Split Editor – A handy feature for editing long documents where you need to compare one section to another. Moving work from Evernote to Scrivener. Evernote is a useful tool for research and jotting down notes but learning to integrate it with Scrivener is challenging without this course. Scrivener for Blogging -A section of the course specifically for bloggers, which includes tips on integrating Scrivener with WordPress. Only included with the Rockstar and Ninja plans. Scrivener for Creating Ebooks – Setting up the right template for ebook publishing for platforms such as Kindle, Smashwords and other self-publishing platforms. Only included in the Rockstar and Ninja plans. Top 75 Tools & Resources for productivity and creativity. 30 Backgrounds so you can fully customize Scrivener. Using MS Word With Scrivener – Since Word is the most popular software used for writing, it’s very useful to know how to integrate it with Scrivener. Using Scrivener with Critique Partners, Collaborators and Virtual Assistants – If you work with a team, editors, ghostwriters or VAs, this bonus is very helpful. Behind the Scenes Expert Series – A 4-part video series that provides additional expert tips on getting more accomplished. 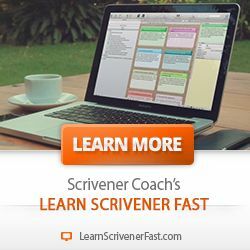 Learn Scrivener Fast has several pricing levels. You may not need every single feature, so you can choose the plan that works best for you. Below are the main features of each plan and the one-time fee. Student: $127 – Includes 32 instructional videos that cover all of the basic and advanced features of Scrivener. Rockstar: $197 – Adds 25 additional Ninja Tricks & Tips videos, Scrivener For Blogging, Easy Ebooks, 8 Power Templates and more. Ninja: $297 – With this plan, you also get membership in a private Facebook group, 10 videos on planning and outlining novels and access to a monthly Q & A session. Occasionally, Joseph offers time-limited promotions to his Learn Scrivener Fast course. At this time, however, there is no active promotion running. We would like, however, reward our readers in some way. We decided, that in case you purchase the Ninja plan we will reward you with the Scrivener software for free (for Windows, Mac or iOS). All you have to do is contact us after making the purchase and we will provide you with the bonus details. In case you already own Scrivener, you are still welcome to contact us and we will find a way to award you with a similar value bonus. Learn Scrivener Fast is a very useful tool for mastering Scrivener. It’s not quite accurate, however, to say that it’s the only good course on the topic. Most of the articles, videos and tutorials on Scrivener fall short when it comes to giving you a comprehensive way to truly master this brilliant but complex writing program. There is, however, one other solid alternative – Scrivener Unleashed. Let’s briefly compare the two. Scrivener Unleashed is the creation of David Lee Martin, an author and marketing professional who, like Joseph Michael, wanted to make Scrivener more accessible for himself and his clients. This course promises to teach you the basics of Scrivener in one hour or less. It mostly delivers on this promise, though if you want to learn all of Scrivener’s features, it will naturally take a lot longer. The course includes 200 training videos in addition to bonuses such as Scrivener For Bloggers, 19 backgrounds, workflow mind maps and Fast Start Ebook. Unlike Learn Scrivener Fast, Scrivener Unleashed only has one version, which currently sells for $49. The sales page claims that the regular price is $149, so the $49 price may be temporary. For now, at least, this course is a little cheaper than Learn Scrivener Fast. Both courses offer solid value and thorough, clearly presented video tutorials. The main difference is that Learn Scrivener Fast offers three different plans and, in its Ninja plan, membership in a community in the form of a Facebook group and Q & A sessions. Scrivener Unleashed also offers support, but not the ongoing community features. Is Learn Scrivener Fast a Good Value? Learn Scrivener Fast is a powerful tool for serious writers who want to get the most out of Scrivener. Unfortunately, many writers are either afraid to even buy Scrivener because of its fearsome reputation or order it and never use it after seeing how complicated it is. This course is a way to overcome the challenges of Scrivener and make you an expert in a short time. You may want to compare Learn Scrivener Fast to Scrivener Unleashed, as both are good courses. It’s really a matter of personal preference. If you want ongoing support and membership in an online community, however, I’d recommend the Ninja plan of Learn Scrivener Fast. I have heard of a 30 day trial for the Scrivener Writing program. However I need a program the can handle both text and just a few graphics. Thus you can see my need for a trial (to see if it can really handle both). So, could you please direct (or just give me the link) to said trial, please. Hi Clint, sent you the details to your email.